The question I receive most often from my seminar attendees is: What books would you recommend for parents and for elementary-age children? Typically, I point parents to introductory-level apologetics texts that will provide a foundation upon which they can gradually build. For preteen children, the pickings are rather slim, which was one of the main motivations behind my Young Defenders apologetics storybook series. Beyond this, however, there were no resources (that I know of) specifically designed for the training and encouragement of parents in the area of actually teaching apologetics and worldview to their children in an interesting and effective manner. I first learned about Ms. Crain’s work through social media groups. Her blog, Christian Mom Thoughts, quickly became a favorite of mine, not only because of the excellent, well-researched content, but also because of the winsome, yet no-nonsense writing style. When she announced her book deal with Harvest House Publishers, I was ecstatic. I knew it would be a ground-breaking and desperately needed tool for parents, especially those in my own stage of life (parenting preteens). As an early pre-reader of the manuscript, I was not disappointed. Ms. Crain had written a book that would serve the Christian parenting community well. The content of Keeping Your Kids on God’s Side is both intellectually rigorous and non-intimidating (no easy feat!). It gently and systematically guides parents through 40 key apologetics topics, including the existence of God, science and creation (my favorite! 🙂 ), objective truth, the identity of Jesus, and the reliability of Scripture. In this way, it serves as a fantastic introduction to apologetics, but the wonderful and unique thing about Ms. Crain’s book is that it approaches all of this from the perspective of a parent desiring to have instructive conversations with their kids. The final chapter of the book, “10 Tips for Having Deeper Faith Conversations with Your Kids,” is the crowning touch that demonstrates how to communicate the imparted knowledge to young minds. 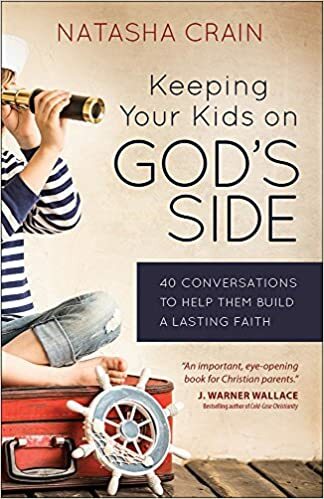 If you are a parent and/or someone involved in children’s ministry in any capacity, I strongly encourage you to get a copy of Keeping Your Kids on God’s Side. Even if you are already well-grounded in apologetics, you will likely benefit from its approach and the practical advice it offers. I will be suggesting it to every parent I encounter.